The Fremont National Forest offers a setting of classic Western beauty derived from the land’s volcanic legacy. The ecosystem ranges from towering snow-capped peaks to wide-open sage basins. The Fremont National Recreation Trail traverses most of the length of the forest from north to south, and the Oregon Desert Trail ties into over 60 miles of this trail system that was designated as a National Recreation Trail in 1979. 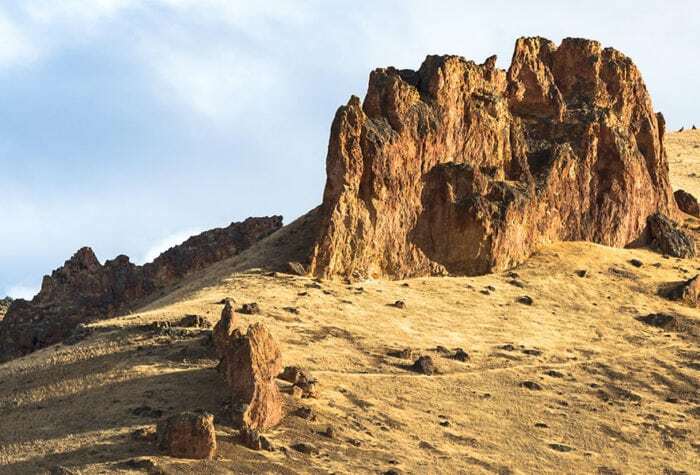 ONDA created the Oregon Desert Trail (ODT) route to link existing trails, old two-track roads and cross country travel as a way to introduce hikers to the stunning landscapes found in Oregon’s high desert. The ODT’s overlap with the Fremont National Recreation Trail is the largest section that ties into existing trail tread for over 60 miles starting at the Chewaucan Crossing near the town of Paisley. Volunteers will be working with members of the local community on this National Public Lands Day project, and together we will celebrate the connection between people and the environment by working together side-by-side with some hard earned sweat equity to improve the trail in this area. We typically head to the work site at 8 a.m. and stop work by 4 p.m. in order to leave time in the afternoon to clean-up, relax and cook a well-deserved dinner. Volunteers will rehabilitate trail tread, remove obstacles, install drainage structures and brush the trail corridor. The section of trail we will be working on offers expansive views down into the Lakeview valley and we will be working alongside members from the local community. No previous trail building experience is needed to attend this trip; ONDA and the Forest Service will provide all instruction and necessary tools to do the job. All that is required is a love of the high desert, a big smile, and a willingness to learn. Friday, September 27, 5-7 p.m.: We will meet and car camp at the Cox Pass Trail Head near Lakeview. Saturday, September 28: It’s National Public Lands Day! After breakfast, volunteers will receive tools training, and should plan to be out all day and be prepared for a full day of hiking and doing physical work. That evening we will celebrate National Public Lands Day together. Sunday, September 29: Volunteers will have the option to head home or spend the morning on a group hike or bike ride along the Fremont National Recreation Trail. We will be car camping at Cox Pass Trail Head near Lakeview. There is a pit toilet available, but no running water, so please be prepared for primitive camping. This trip will require hiking and physical work at elevations around 6,000’. Please be prepared for early fall weather. Participants are responsible for their own food and camping gear as well as transportation to and from the trip (don’t forget your camp chair!). ONDA will bring water, but it is a good idea to supplement our supply with a few gallons from home. In the event of sunny and hot weather, please bring up to three liters of water capacity for the day, and consider an electrolyte replacement drink or mix to help you stay hydrated. In the event of cold, rainy weather, please bring several warm layers, a warm hat, and rain gear. Sturdy off-trail ankle-high boots, long pants, a long-sleeve shirt, and eye protection are required for this trip (sunglasses or prescription eye glasses are suitable eye protection). Participants will need to wear a hard hat during the work per Forest Service requirements (ONDA will provide), and should be prepared to be away from camp all day and bring a daypack for lunch, snacks, and water. ONDA and the Forest Service will provide tools for the work, work gloves, sunscreen, and hardhats. ONDA will bring some group camping equipment (shade tent, tables for cooking, wash bins for kitchen cleanup), some potable water, expert leadership, and we can talk about long distance hiking on the Oregon Desert Trail. This trip will be led by Renee Patrick. If you have questions, you can contact her at (541) 330-2638 or email renee@onda.org.